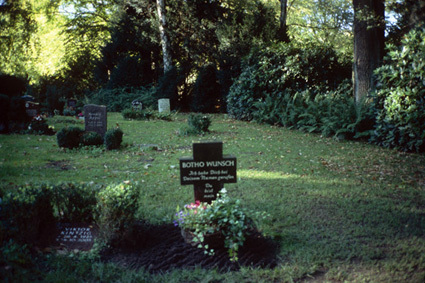 »Here we are on the Öjendorf-Süd cemetery. It smells of autumn. The area where my husband has been buried is called Quartier, an area where there are no regulations how the graves have to look. I did decide to have a cross made. The cross is made out of indian black granite with a glimmer of green. It is inscribed with my husbands name, without dates, and a phrase taken from the old testament: ›I have called you with your name and you are mine‹.